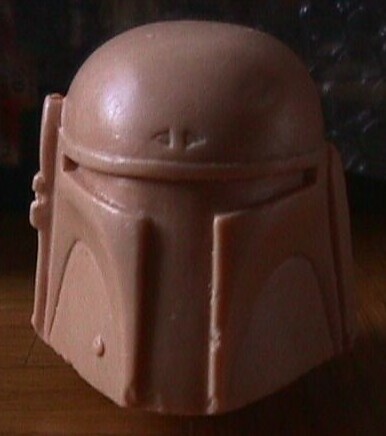 That's right, this is the actual wax master sculpting for the head of Hasbro's CS12 Boba Fett doll. The pinkish wax used on this piece is pretty standard--its what's used to sculpt many of Hasbro/Kenner's toys. Here you see the bottom. 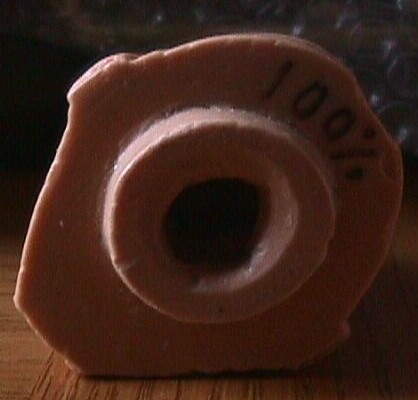 The "100%" that's been written on the base was probably meant to indicate to whoever was handling the subsequent production steps (silicon mold making, hardcopy creation, etc.) what scale the piece was sculpted in. Many toys, remember, are intentionally sculpted larger than their intended production sizes, in order to maximize their detail.